Columbia, Mo. (Aug. 20, 2015) — On the eve of the launch of its first two courses, the new Jonathan B. Murray Center for Documentary Journalism hosted noted filmmaker Rachel Boynton in a pre-semester workshop for students called “Stronger than Fiction.” Boynton is the first to appear as part of the center’s Visiting Artist series. The series brings in half a dozen or more experts each school year to share their expertise as directors, editors, cinematographer, composers and more. 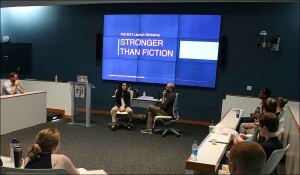 Filmmaker Rachel Boynton is interviewed by Assistant Professor Robert Greene during the “Stronger Than Fiction” workshop at the Missouri School of Journalism. Boynton is best known for her feature documentary work focusing on the impact of American involvement in other nations. Her 2005 film “Our Brand Is Crisis,” which focuses on the role of American political consultants and their work on a Bolivian presidential election that leads to bloody conflicts, won praise as the International Documentary Association’s best feature film that year. Her most recent film, “Big Men,” delves into the relationship between emerging African nations and the American oilmen who wish to profit there. Boynton brought her knowledge of international documentary work to the students preparing to enter the documentary journalism interest area in fall 2015. This is the first semester for the new interest area, which debuts with one new lecture course and another special section that emphasizes hands-on documentary work under the Missouri Method model. Boynton’s presentations included showings of “Our Brand Is Crisis” and “Big Men,” with discussions of both films led by assistant professor and Murray Center Filmmaker-in-Chief Robert Greene, a review led by Boynton describing the various approaches documentary directors use to focus their work and an exercise to involve students in the process of pitching a documentary. Other elements of the workshop included a talk by director Nick Berardini, BJ ’09, about his feature documentary “Killing Them Safely,” on which he began work while still a student in the School of Journalism. Students also heard from Anthony Martinez, BJ ’14, as he described his employment options after graduation and his work in both the corporate video and independent documentary worlds. The Murray Center was made possible by a gift of $6.7 million from Jonathan Murray, BJ ’77, an Emmy Award-winning alumnus and former chairman of Bunim/Murray Productions. The goal of the center is to provide innovative teaching, professional outreach and research programs to further the work of documentary journalists around the world. Stacey Woelfel is the director of the Murray Center.